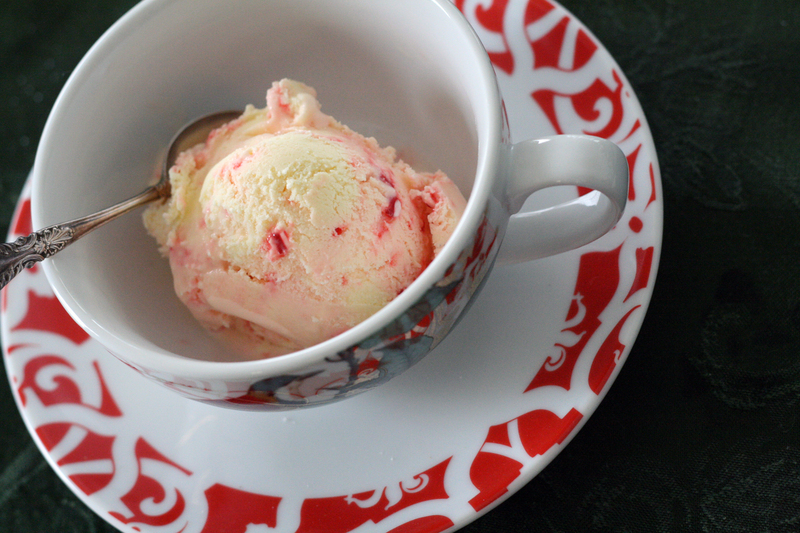 Peppermint ice-cream is such a delicious seasonal dessert! And, when it's homemade, it's nothing short of luxury! If possible, make the custard the night before you plan to use it, chilling it in the fridge overnight. If you are in a rush, stir it over the ice bath until very cool. Warm the milk, sugar, and salt in a medium saucepan. Make sure the sugar and salt completely dissolve. Pour the cream into a metal bowl set in a larger bowl of ice and set a medium-mesh sieve on top. Stir the mixture constantly over medium heat with a wooden or heatproof rubber spatula, scraping the bottom as you stir, until the mixture thickens and coats the spatula, about 5-7 minutes. Don't think twice when the mixture coats the spoon -- remove it from the heat immediately! Pour the custard through the strainer and stir it into the cream. Then stir until cool over the ice bath. Chill mixture thoroughly in the refrigerator. Once the mixture is thoroughly chilled, add peppermint extract, a 1/4 teaspoon at a time, tasting the mixture after each addition, until you reach the desired level of peppermintiness. Once chilled, freeze in your ice cream maker according to the manufacturer's instructions.